First Lady, Fathimath IBrahim has arrived in Addu City today to take part in a special PPM event. The PPM event "Magey Gaumaa Magey Dheena Nukulhehchey" (Don't meddle with my nation and faith) in Addu City is being attended by cabinet ministers including the Economic Minister, Mohamed Saeed and the Health Minister, Adulla Nazim along side some of the MPs with PPM. 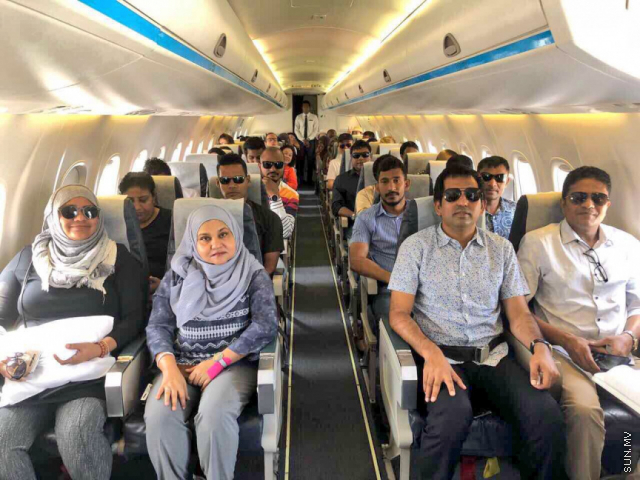 MPs visiting Addu City for the event include the Leader of the PPM Parliamentary Group, Ahmed Nihan Hussain Manik, MP Riyaz Rasheed and the MP for Inguraidhoo constituency, Ibrahim Falaah. Aside from the rally in Hithadhoo, the city started different evening festivities along with a special event at the Hithadhoo stage area. PPM officers across Addu City are hosting events as well.